Tuesday’s midterms saw more than 100 LGBTQ candidates elected. Tuesday was a day of historic firsts for our country. The “rainbow wave” that so many had hoped for seems to be here, with more than 100 LGBTQ candidates winning their races at the midterm elections. One of the biggest victories of the night was flipping the House blue. LGBTQ candidates took eight federal office seats, 86 state office seats, and 34 local office seats. “This election is shaping up to be truly historic for LGBTQ candidates, and coupled with the change in leadership in the US House of Representatives, shows a rejection of the hate-fueled politics of the Trump Administration that have heartlessly targeted LGBTQ people, women, immigrants, Muslims, and all vulnerable populations,” said Sarah Kate Ellis, President and CEO of GLAAD. 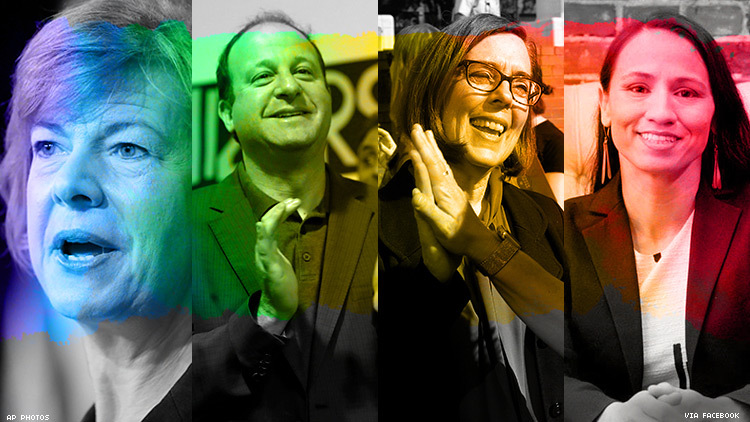 Jared Polis made history as the first openly gay man elected to governor in the US. He won his gubernatorial race in Colorado, beating his Republican opponent by a strong margin. He led his campaign as a very vocal and visible member of the LGBTQ community. In a race that was heavily watched by both sides, Senator Tammy Baldwin won her reelection in Wisconsin against an anti-LGBTQ opponent. Baldwin was the first openly LGBTQ person elected to US Senate back in 2012. Also in Wisconsin, openly gay Representative Mark Pocan won his reelection. Governor Kate Brown of Oregon also won her reelection. Brown was the first openly LGBTQ governor in the US when she was elected in 2015. Sharice Davids of Kansas became the first openly LGBTQ Native American woman elected to congress. Angie Craig of Minnesota and Chris Pappas of New Hampshire became their states’ first openly LGBTQ officials elected to Congress. Massachusetts also made history with Yes on 3. The initiative upholds protections for transgender people. It was the first statewide popular vote in support of transgender rights. For months, the left took on a passionate plea to get voters to the polls. It seems to have paid off as the “blue wave” and “rainbow wave” so heavily promised have found success. But with the Senate still red, our fight is now more crucial than ever. Thinking About Having A Gay Wedding? Challenges Of Planning For That Special Day In A Conservative State.